It has happened. The Christmas lights on Capel Street near the Dublin HQ Office have been hung up. For us, this means that whether you already feel merry or not, it’s time to start thinking about your salon or spa’s marketing strategies for the busy season. Of course, we’ve made it so that these November loyalty marketing ideas take a good load of work off your shoulders. Shall we? This month, we celebrate the return of the Attitude Of Gratitude loyalty scheme, share with you a holiday season marketing calendar, SMS and email templates and as usual, a few posters and graphics highlighting a few of these ideas! Download the November loyalty marketing toolkit today (free)! Loyalty programs are nothing new in the hair and beauty industry. Yet, still too often we see the same old coffee shop schemes. Like we’ve said before, the ‘money off’ type of reward may be an easy way to treat clients, but it’s not what’s going to boost your business’ profile or revenue in the long run. What kind of loyalty program do you use in your salon? “To ensure your loyalty scheme provides a return, incorporate it into your business model and make sure that staff and customers fully understand it.” – Frank Cappalonga, owner of the Frank Di Lusso hair salon, “How to make a loyalty scheme work for your business,” The Telegraph. You know it far too well: as December gets busy, so does the phone at the reception desk. Once again -I’m telling you, November is all about preparing for the rush- make some time this month to record new voicemail greetings, update your salon email auto-responder and most importantly, make it possible for your clients to book online! By the latter, I mean on your website, Facebook and your app (if you have one!). In fact, on another recent Phorest FM episode, we chat to Alan Stewart, founder of Rainbow Room International about how being ‘open’ 24/7 on multiple platforms has positively impacted the growth of his business. A simple ‘Book Now’ call-to-action on your page can increase your revenue by up to 29%! It’d be non-sense to miss out on that no? Here’s how to set your booking link up, and here’s potentially why -if you currently have online bookings and not seeing a revenue increase- they’re not giving the expected results. Get five SMS templates and two email marketing templates to promote your online booking link! You send clients that are in your salon this December an SMS or Email that includes a special present: a Christmas Gift Card. You set the rules: you decide the value on the card, pick the minimum required spend and set the expiry date (we strongly recommend setting that to January 31st). 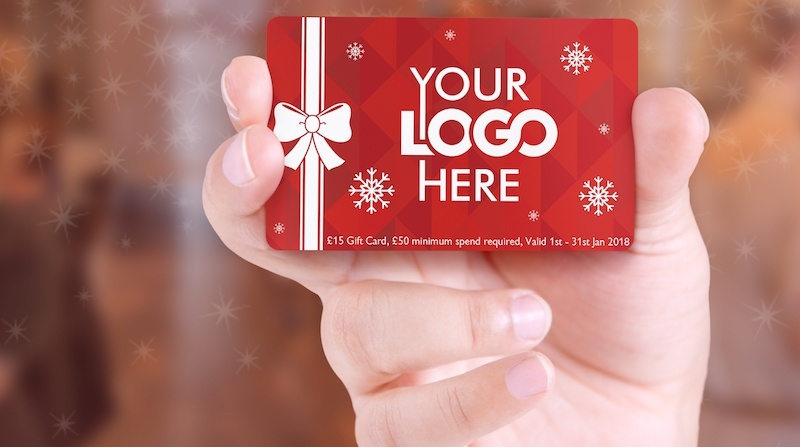 The Gift Card itself can only be redeemed in January, which means that for your customers to avail of their special gift, they must book another appointment. The Attitude Of Gratitude is all about taking advantage of your busiest time of year and feeling the benefits in the quiet month of January. You don’t need a special day to go the extra mile for your clients, in fact, you should already be doing that every day. However, given the International Extra Mile Day, it’s the perfect opportunity to do something you wouldn’t do on a regular basis in the salon. Let’s take a rainy day for example. Could you perhaps walk your client to their client under an umbrella? Pay real good attention to what clients tell you on this day, and try to wow them with something they’d never expect you to do. This special day is great if you’re into sharing behind-the-scenes moments in your salon, or even show off your amazing team! Get everyone on your team to think about a unique talent of theirs and get them to showcase it on your Instagram stories! Alternatively, you could also ask your audience to send in videos displaying their talent for a chance to win a product or a complementary treatment on their next booking. Either way, make it colourful and fun for everyone! Oh, and don’t forget to use hashtags to get discovered! Who doesn’t love a good parfait? Team up with a local cafe for the event and treat your clients to a delicious edible surprise! Again, it’s a great opportunity to get clients talking and make a splash on social media, building your brand awareness. Don’t forget to tag your business partner in your post for best cross-promotion results! Giving Tuesday is a global day of giving celebrated on the Tuesday following Thanksgiving in the US. The idea behind the now 6-year-old initiative is to bring people from different industries, organisations, families and businesses together around the values of service and giving back. If you’d like to learn more about it, check out the movement’s website. And of course, if you’re thinking about getting involved, make sure you tell your clients through SMS, email and social media, perhaps encouraging others to take part or even to come into your salon on the day to make a donation. It’s the small gestures that matter the most, and there’s no better way to make something happen than by leading by example! 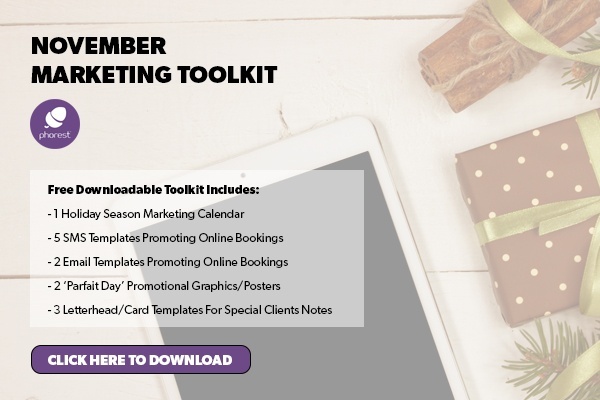 Don’t forget to download your marketing toolkit, designed to work hand in hand with these November loyalty salon marketing ideas! 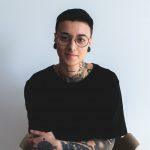 Not a Phorest Salon Software customer? Request a free demo today and see all the other ways we can help you get clients in more often, spending more! If you have any thoughts or comments on these September salon promotional ideas, let us know here or tweet us @ThePhorestWord!